Burchell's zebras are now extinct. They were the lightest-colored of all zebras, with completely white legs and no stripes on their stomachs. A plains zebra. 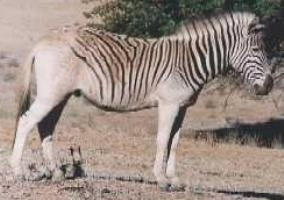 A southern subspecies of the plains zebra, the Burchell's zebra (Equus burchelli burchelli), lacked stripes on the hindquarters. Its basic body color was reddish-yellow. Burchell's zebra existed from southern Botswana into the Orange Free State of South Africa . As European settlement spread northward from the Cape to colonial Southern Rhodesia , this subspecies was hunted to extinction. The wild herds had disappeared by 1910, and the last known individual died in the Berlin Zoo in 1918.